Sorry About Tomorrow is the debut album from NY/NJ-based ElectroPunk duo This Wilderness. The album was recorded at Upper Studio in New Jersey, produced by the band’s main instrumentalist Jim Coleman of Cop Shoot Cop renown. Sorry About Tomorrow is being released May 4 by the Wax & Wane label. Leaver and Coleman first met at a New Year’s Eve party as 2015 became 2016. Sharing a gravitational pull towards darkness and an irreverent humor, the two musicians have emerged as This Wilderness. Leaver had been working on acoustic based music as Birdthrower (recently recording with Ben Harper), as well as doing provocative public art performances (Crawling Home, Hole Earth and Man Down). Coleman had a more electronic pedigree, crafting samples and electronics for the infamous industrial rock band, Cop Shoot Cop, then releasing albums as Phylr, Here, Jim Coleman and J-CO. Since forming, This Wilderness has had audiences riveted by their live shows in and around NYC for the past couple of years. 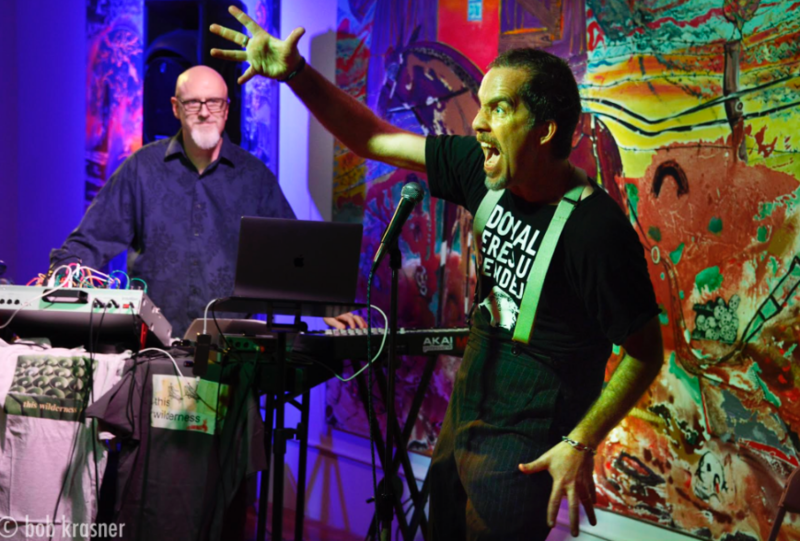 It is an unforgettable experience merging old New York punk, folk and industrial realism – catapulting the audience into a disturbance of hilarity and personal reckoning.